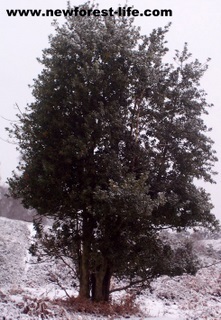 New Forest snow in 2010 is killing our birds and wildlife. New Forest snow of 2010 means death to our wildlife and birds. This is a new page I've set up because of the unusual weather we are experiencing during January 2010. The New Forest wildlife page will continue to grow throughout the future. Yesterday, on BBC News South, I saw a programme on flocks of Fieldfare and Redwing which were being driven further and further south by the January 2010 snow, which was coming down from the north of England. Apparently, these flocks survive by flying ahead of severe winter conditions. The snow kept forcing these birds to the very tip of England. They ended up at Hengistbury Head where they faced the sea. These brave wildlife were then presented with a problem. Did they risk the sea or continue to circle in their bird groups, hoping to sight safety and food? Their numbers were amazing 10's of thousands of birds. They eventually landed in a few fields in the area, which was a stunning sight in itself. They then struggled to find any food, but ofcourse there was hardly any to start with, especially for such huge numbers! This morning I saw a sad sight which brought home to me the struggle the New Forest wildlife, and in this instance, our birds were having, during this extreme and very unusual winter snow. 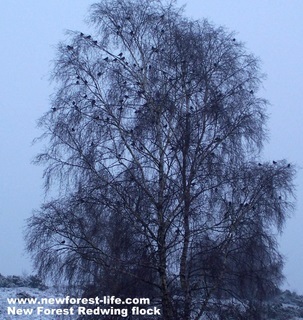 Here you can see a flock of Redwing perched in a large silver birch tree in a New Forest valley, on the edge of a mire. As I watched they were flying backwards and forwards to the holly tree - the picture on the right. I don't know how they worked out who was to try to eat the few holly berries on this tree or if it was first come first served, but it was a sad sight. The ground was snow covered. Too hard for any bugs or worms or insects to be prized out. The number of holly berries was nowhere near enough for all these birds to be able to survive. As I took these photos and then came away I was struck by how harsh these winter snow conditions were for the New Forest wildlife, and as I saw today especially our winter birds. I also wondered just how many would survive tonight. 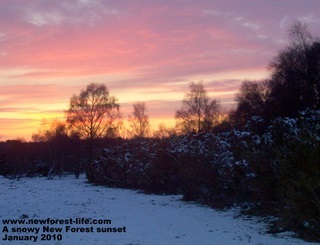 A beautiful New Forest sunset following a day of snow and falling temperatures - I wouldn't like to be out in it with little or no food. Despite the ground cover of gorse and other vegetation it is still hard environment for birds and wildlife, especially as their body weight needs to be maintained by eating adequate food during the day - something I'm sure everything I saw has struggled with. Find out how you can help your local wildlife birds. There is lots of really valuable help from the RSPB - help New Forest wildlife birds in the snow.